It took nine months to put it on, expect nine months to lose baby weight safely. For months after giving birth, your body shows many telltale signs and feelings that you have grown and delivered a baby. The excess fat accumulated during pregnancy – normal reserve energy stores for you and your baby – may leave you with unwanted postpartum bulges. Pushed-out tummy muscles may weaken normal abdominal support for the back and contribute to backache. Most new mothers are concerned with hot to lose baby weight and tone muscles. Patience and persistence are the keys to safely lose baby weight. It took nine months to put it on, expect nine months to take it off safely. Breastfeeding mothers require, theoretically, an average of 500-600 extra calories per day to provide adequate nutrition for themselves and their babies. These figures are averages. If you were underweight prior to or during your pregnancy, you may require more calories to prevent under nourishing yourself. 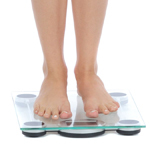 If you were overweight, you may require fewer calories as the excess fat stores in your body are gradually used up. Several studies in the late 1980s showed that metabolic efficiency is enhanced during lactation, so that the theoretical recommended daily values (RDVs) for lactating women may be higher than what is actually needed. The key to weight loss during lactation is to find the level of calorie intake that works for you individually. Figure out your daily basic caloric needs. Set realistic baby weight loss goals. A gradual weight loss should be your goal; usually around 2 ½ pounds per month, slightly more if overweight, less if underweight, prepregnancy. Gradual weight loss is best during breastfeeding. Burning off fat quickly is not safe because the body stores pesticides and other contaminants in fat. Quick weight loss releases these contaminants into your milk. Choosing an activity that you enjoy – preferably one that you can do with your baby – makes it much more likely that you will stick with it. This could be something as simple as walking briskly while carrying baby in a sling. Brisk walking or swimming for one hour burns off around 400 calories. This exercise plus abstaining from one unnutritious treat each day (one chocolate chip cookie is around 100 calories) means you have a deficit of 500 calories each day or 3,500 calories per week – enough to lose one pound of body fat. Invest in some nice, comfortable clothes that fit your postpartum figure. If your only focus is to lose baby weight and get back into the jeans you were wearing nine months ago, you could get very depressed. And no one wants to keep on wearing maternity clothes for weeks after the birth. Some pants or leggings with an elastic waist and a few colorful tops will help you feel better about your still-changing body. Two-piece outfits that are easy to breastfeed in will make it easier for you to get out and around with your baby. Breastfeeding women often experience their greatest weight loss between three and six months postpartum, when they are producing a lot of milk for their babies. So don’t get frustrated if the pounds aren’t coming off at first. Chart your weight loss, and tailor your exercise and eating habits to reach the goal you set.